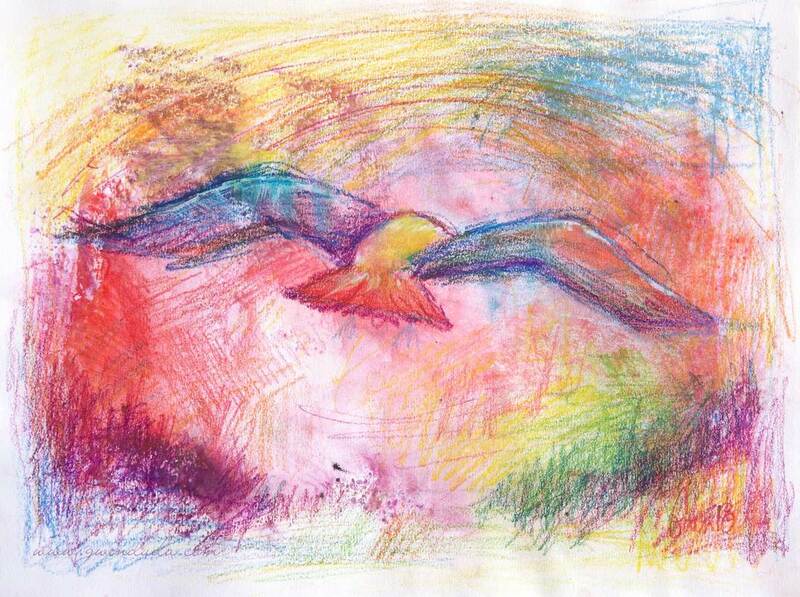 Titled "Fly Away" this original watercolour with acrylic done on paper painting is truly a beauty in rainbow colours. As I have my meals I look out my window and see seagulls flying over the city. When they arrive in the city spring is right behind them. They are pushy and bold, raucous and cagey but I love them. Their aerodynamic silhouette is sight to behold in either a rainstorm or with the summer setting sun glinting gold off their light bodies. I utilized both indirect and direct painting for this piece which was mostly done in neopastel watercolour pastels, watercolour pencils and a touch of white acrylic paint. Measures 12" (30.48 cm) x 9" (22.86 cm).